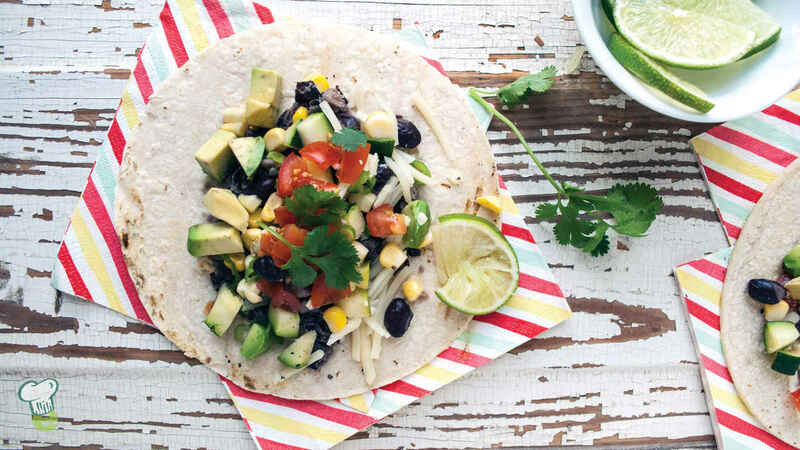 This yummy tostada recipe makes a satisfying healthy lunch or dinner. Black beans, zucchini, corn and cherry tomatoes make this colorful vegetarian recipe delicious and nutritious. Preheat oven to 400°. Arrange tortillas on 2 baking sheets and toast in oven until crisp, about 5 minutes. Remove from baking sheets. Lightly spray baking sheets with nonstick cooking spray. Spread beans and onion on one and zucchini and jalapeños on the other. Lightly coat vegetables with cooking spray, season with the black pepper and roast until golden, 12 to 15 minutes. Transfer half the beans and onion to a bowl with the water and mash beans with the back of a fork until smooth. (Add more water to reach desired consistency, if necessary.) Spread mixture onto tortillas. Toss remaining beans and onion with zucchini, jalapeños and corn and divide among tortillas. Top each tostada with tomatoes, cilantro, cheese, scallions and avocado. Serve with lime wedges, if desired.